Alas! The two sisters ran into no further distractions and finally made there way to the holy grail…The Golden Lamb Buttery! 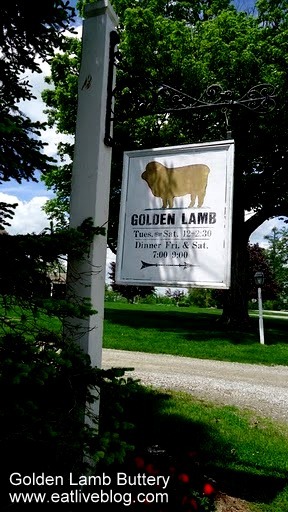 You may remember that The Golden Lamb was a destination around which our entire trip was planned. About 2 years ago, Debbie and I were exploring the Connecticut Wine Trail and we made a wrong turn down a farm road. Low and behold, at the end of that road was this amazing destination! Now, I am not going to lie, we did go in hoping it was, literally, a buttery. 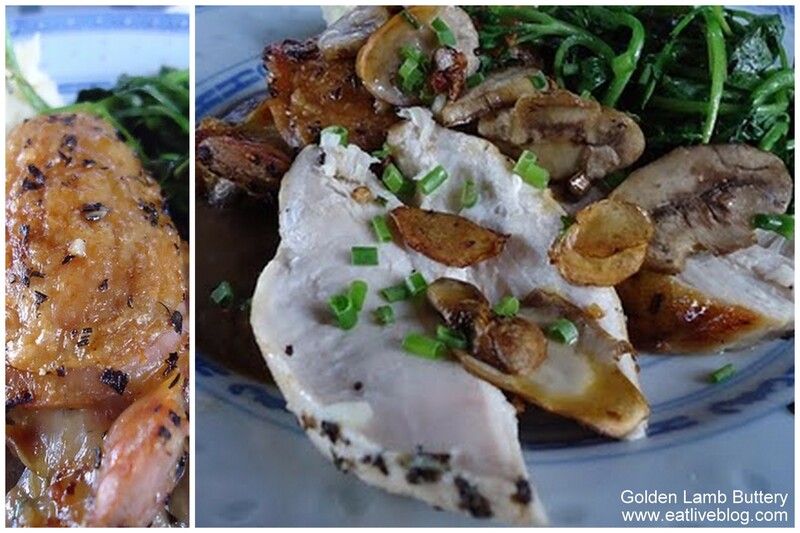 Instead we were surprised to find a coveted, local gem that brags of celebrity diners and hard to get reservations. Once we arrived, the waitress will ask if you would like to have a drink on the patio, or if you would like to head straight in to the dining room. Always choose the patio! The scenery from the porch is breath taking, countryside for miles, and watching the farm’s own donkeys and goats graze in the field instantly puts you in that vacation frame of mind! The wine list is lengthy, and we went straight back to the local wine section. We ordered a bottle of our local favorite, Ballet of Angels by Sharpe Hill Vineyard. By the way, Sharpe Hill also has an amazing restaurant, where the chef literally heads to the garden to pick the vegetables after you order your meal! After we were good and unwound, we headed into the dining room. Now, let me set the stage. The Buttery is a giant old, red farmhouse. You walk into the main barn which is filled with tastefully set farm memorabilia. 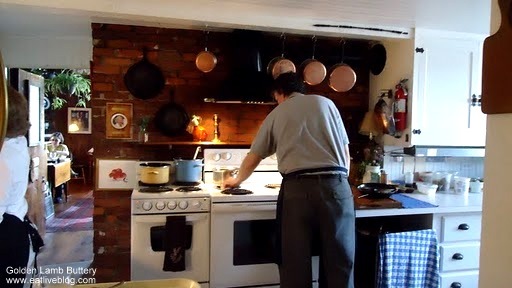 So, it seems exactly right that on your way to the dining room, the hostess walks you directly through the small farmhouse kitchen where all the food is prepared! The menu is presented via a blackboard, sans prices (just fyi). The menu is seasonal and every ingredient is local and fresh. We decided to start with 2 soups, since they sounded so good, and ignoring the fact that it was the first summer scorcher of the season. 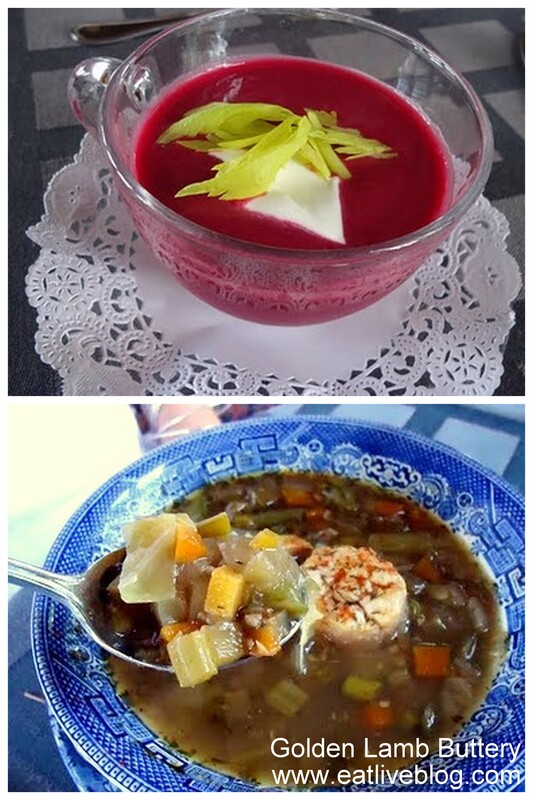 Lucky for us one of the soups was a cold borscht. The other was a country vegetable. They were both rustic, earthy, and let the ingredients speak for themselves. In other words, delicious. Look at that golden, baked skin! The chicken, the goat cheese mashed potatoes, the garlic jus, and the pea tendrils, every bite was garden-fresh ecstasy! The half portion was big enough that we turned down desert (I know, right?!) But wait! What was it we had last time we were here? I could have sworn there was some kind of delicious muffin, or bread, or something to that effect….and I see baskets on other tables….what the?! It was zucchini carrot bread! How could we have forgotten! Last time we were here we enjoyed it so much we ordered a loaf to go! It was equally as delicious as last time, and totally filled the no-dessert void. 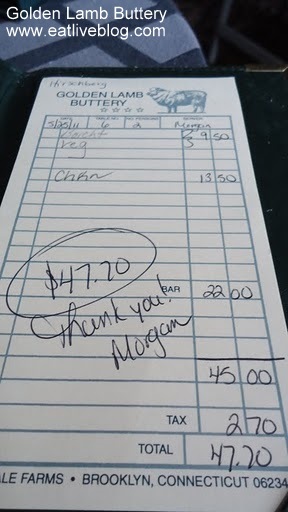 So, we paid our bill (which was surprisingly reasonable for a place with no prices…remember, this included a bottle of wine!) and we headed on to our next Summer Travel in New England destination, The Inn at Lower Farm! This entry was posted in Reviews, Travel in New England by reneeh. Bookmark the permalink. Thanks Elizabeth! It is so fun to go back and revisit everything through the pictures! sounds like a great time. My friend and I have been talking about going there for a while now. the timing never works but I hope we can go there one day. I’m salivating over the mashed potatoes with goat cheese. They were so good! 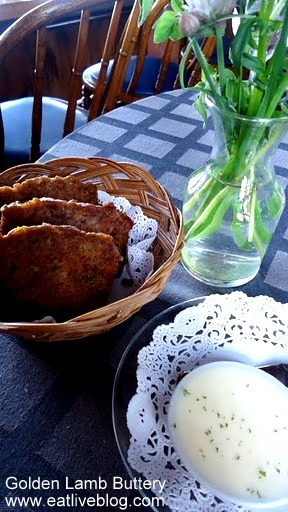 During the same trip we also had Boursin mashed potatoes at the Daniel Packer Inn. Ah-Maze-Ing! This place looks so adorable! I’ll have to try out the Connecticut Wine Trail. I didn’t know they had so many wineries! It is so surprising! They even have a little wine passport you can keep track of your visits in. Wow. I’m originally from CT but never heard of this place. I am so glad you stumbled upon what looks like an amazing dining experience. Can’t wait to check it out for myself! You MUST get there! Also the Sharpe Hill Vineyard. Both are dining experiences worth driving to!